This post is brought to you by Humboldt Redwood and The Motherhood. All opinions are my own. 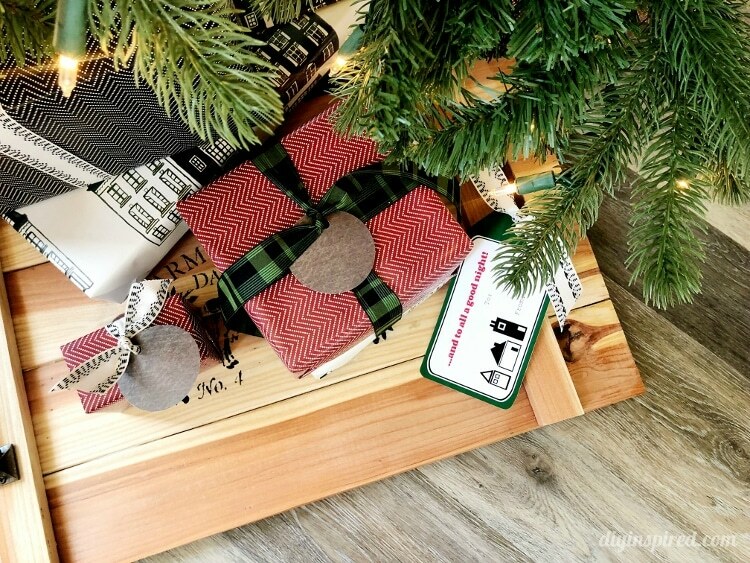 Give a handmade gift this holiday season, with #RedwoodDIY in mind! Recently I shared how to build a simple redwood serving tray. 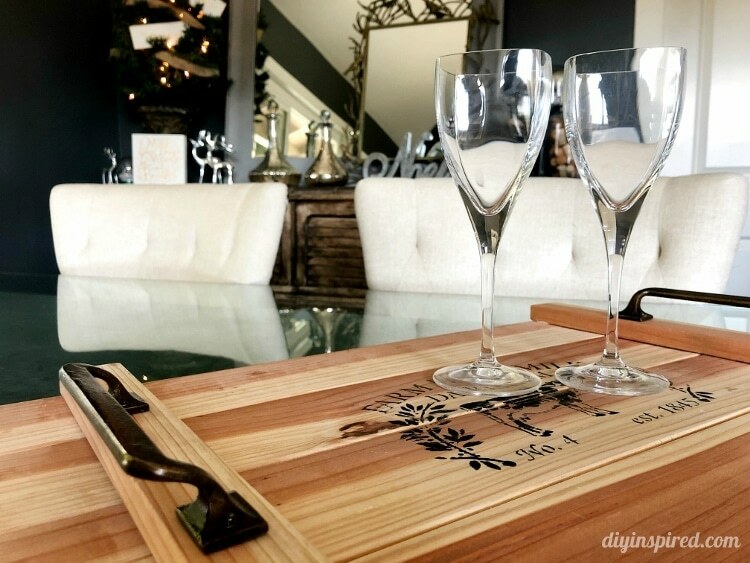 A handmade redwood tray makes a great hostess gift for the holiday parties you attend this season. Make one for yourself and use it for New Year’s too! 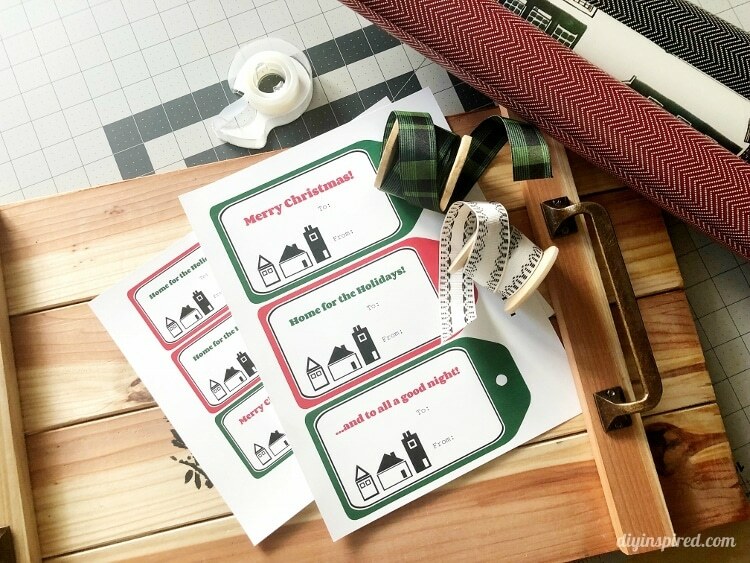 Inspired by my wrapping paper this year, I decided to design and share some free printable gift tags. I made them in two sizes, both large and small. The large one is perfect for a handmade tray like this one. I recommend printing them on a heavy weight paper like card stock or brochure paper. Simply print, cut, and hole punch! Much lighter in weight than plastic composite and tropical hardwoods, redwood can be easily cut, sawed, and drilled with regular woodworking tools, making it an ideal material for this season’s handmade holiday projects. Don’t let the lightness fool you: redwood is one of nature’s strongest building materials. Therefore, it’s perfect for making a serving tray. It’ beautiful. In the days of trendy DIY painting projects, sometimes it’s better to stay natural. Humboldt redwood’s natural colors and wood knots are gorgeous as is, adding to whatever handmade project you choose. Lastly, redwood is environmentally sustainable. Humboldt Redwood products are grown and harvested in a responsible, ethical manner with an eye for long-term sustainability; environmental stewardship is the cornerstone of our corporate culture. One more thing… it looks great under your tree!